This winning entry from our Glitterati Style File Contest (Western Canada) is filled with wedding eye-candy in shades of gold and ivory. 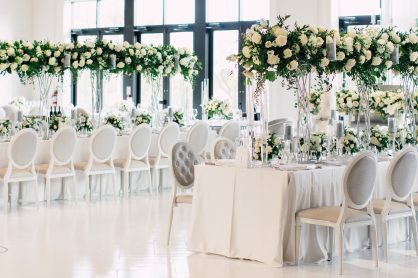 Soha Lavin of CountDown Events Planning & Design, (creative director and producer for the photo shoot), was inspired by design elements found in old cathedrals. Hong Photography captured the editorial on location at Cachè Couture Atelier in Vancouver. We love the exquisite stationery and chair backs decals designed by PALETTERA Custom Correspondences.